Juliana, the future Queen of the Netherlands and mother of current Queen Beatrix, wore diamond roses in her hair to wed Bernhard. Marie José's mega tiara was made for her husband's grandmother, Queen Margherita, and is still with the (now exiled) Italian royal family. 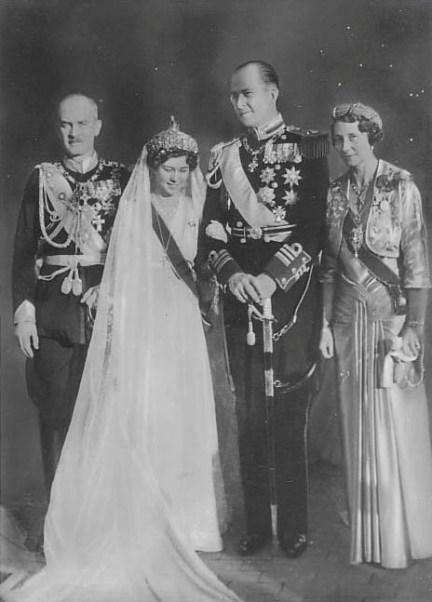 Frederika is wearing both Queen Sophie's Diamond Tiara and the tiny Hanover wedding crown, which I must say looks a little odd perched up there. They married in a registry office in Scotland; since she is Catholic, Lord St. Andrews is currently excluded from the line of succession. 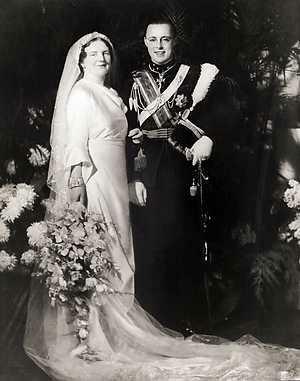 Margriet is the daughter of Queen Juliana (and sister of Queen Beatrix). 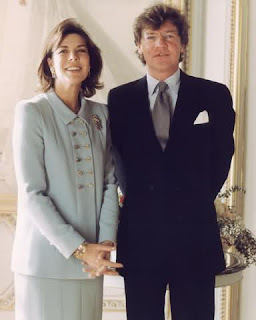 It was just announced this month that this happy couple are to be grandparents once again, as their son Prince Floris and daughter-in-law Princess Aimée are expecting their third child! 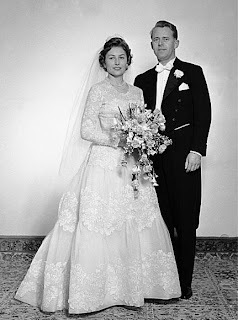 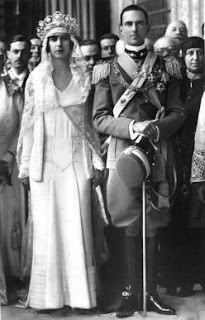 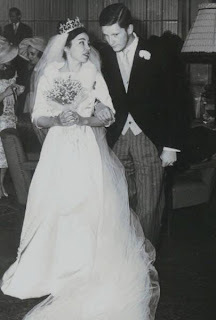 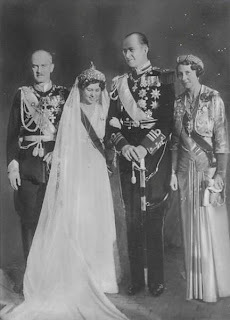 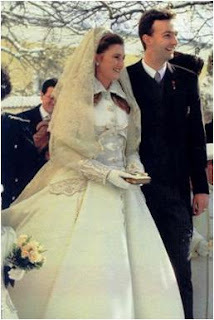 Thrifty Princess Astrid (sister of King Harald) had her wedding dress modified for use as an evening gown later on. 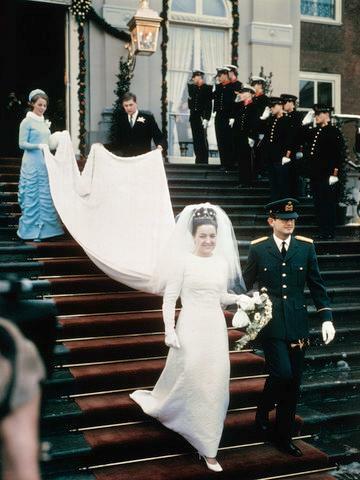 Margarita's diamond tiara includes red and green stones - the colors of the Bulgarian flag. 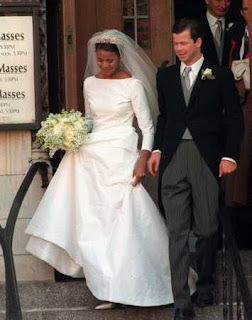 Another royal (okay, princely if you must) wedding in the United States: these two held their religious wedding in New York City. Maximilian is one of the sons of the current Prince of Liechtenstein, Hans-Adam II. 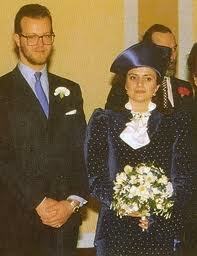 Her Versace gown is the definition of winter theatrics, no? Who's your favorite January bride?